Fairy Godmother takes you on a truly enchanting visual adventure as you explore Cinderella's world. With items from the story like the original invitation to the ball, original illustrations, and the private thoughts of Fairy Godmother herself, you'll see inside the life of a girl who never gave up believing in her dreams. 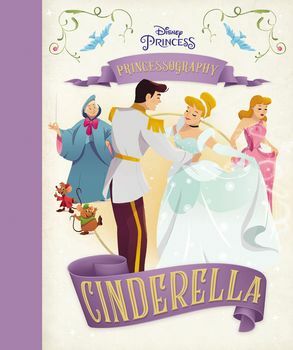 Cinderella: Princessography is a unique, in-world account of Cinderella’s story featuring lush, original illustrations on every page. Told from the perspective of her Fairy Godmother, readers experience a truly enchanting visual adventure as they move through the village, visit the Chateau, meet the prince and several animal friends, and of course, encounter a bit of bibbidi-bobbidi-boo! The book includes items from the magical story on each spread, featuring the original invitation to the ball, a dash of Fairy Godmother’s magical dust, the key that Jaq and Gus used to rescue Cinderella, and much more. With found artifacts, original illustrations, and the private thoughts of Fairy Godmother herself, this book is a fresh take on the timeless classic, allowing readers to become fully immersed in the world of a girl who never gave up believing in her dreams and the magical guardian who helped make them come true.